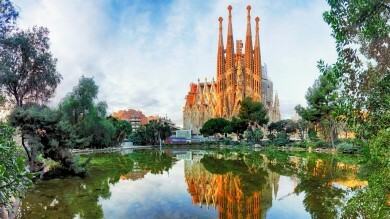 The four main Balearic Islands floating off Spain’s east coast in the sun-soaked Mediterranean Sea attracts locals, tourists, and celebrities in need of an exotic holiday. If you’re thinking about taking your next holiday to the Balearic Islands, there are a few things you should consider first. Whether you prefer to spend your time lounging on postcard-perfect beaches, appreciating the area’s natural history, biking remote cliffside trails, or partying all night long as some of the world’s hottest DJs spin their tunes, there’s something for everyone in a Balearic Island holiday. You just have to pick the right island for yourself. Arguably the most popular Balearic Island, Mallorca boasts beaches, gothic architecture, mountains, ancient-walled towns, and offers a variety of ways to get out and experience all of them. Mallorca also gets the stamp of approval from the royal family, who visit the island annually to enjoy sailing and shopping. Who is it for: The southwest of Palma, Magaluf, El Arenal and Puerto Portals are for the party people. Families, couples, and those who seek tranquility should head to the northern towns of Port de Soller, Port de Pollenca, or east to Cala Bona. Where to stay: Despite its popularity, Palma makes a great base for discovering the rest of the island. If you want to stay in the thick of things, we suggest the 4 star Boutique Hotel Posado Terra Santa. This renovated 16th century mansion is tucked cozily away in the Palma’s historic old town and is within walking distance to most of the city’s main attractions, bars, and restaurants. Rooms start at USD 230 per night. Remove yourself from the madness and stay in Los Geranios in Port de Soller. This beachfront property starts at just USD 120* per night. Playa de Muro, framed by mountains on one side and the azure Balearic Sea on the other, is one of the best rated beaches in Europe. Le Seu (AKA Cathedral of Santa Maria of Palma), a 14th century cathedral in the island’s capital city, is a masterpiece of Roman gothic architecture. The golden sandstone building soars 44m tall, making it one of the highest of its kind in Europe. Palace de l’Almundaina, conveniently situated across the street from Le Seu, is a former-Islamic fort converted into a royal residence for Mallorca’s monarchs in the 13th century. Serra de Tramuntana, the mountainous backbone of the island, is a UNESCO World Heritage Site for its culturally rich landscape. The region can be explored by train from Palma or via the long-distance, multiday trekking route. Alternatively, you can rent a car and enjoy a leisurely self-guided cruise. Estellencs, a small seaside village located within Serra de Tramuntana, claims cobblestone streets, bright bunches of colorful flowers, and historic facades. Wander just 15 minutes away to a secluded beach with a quiet bamboo beach bar for the area’s best sundowner spot. Palma and Magaluf in southern Mallorca are packed with bars and nightclubs and known as the two party capital cities. If late nights and drunken revelers aren’t your scene, stay away. 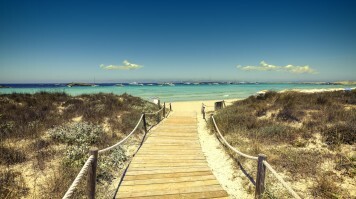 The southwest of the island around Palma can be extremely overcrowded in the peak summer months of July and August. Traffic is also a known problem. Consider planning a trip in the shoulder months. Deriving its name from its diminutive size when compared to neighboring Mallorca, Menorca sits off its larger cousin’s northeast coast. With its undeveloped coastline and laid-back vibes, Menorca is the place for those looking to distance themselves from the hoard of tourists on Mallorca and the heavy club scene of Ibiza. Who is it for: Party people won’t be satisfied with the nightlife here. Menorca is better suited for families and couples who enjoy nature, history, and an abundance of tranquil beaches. Where to stay: The 4 star Sindic Hotel in Mahon offers sleek lined modern rooms with spacious outdoor patios offering city views. Guests love the outdoor pool and excellent on-site bar and restaurant. This is a highly-rated property for couples. Rooms start around USD 140 per night. Sodium Boutique Hotel in Ciutadella offers bang for your buck at USD 80* per night, with each room uniquely decorated with work from local artists, a garden patio, private sunbathing area complete with sunbeds, with a beach nearby. The location is also excellent for exploring the attractions around the city. Mahon Port offers boutique shopping, bars and restaurants as well as some epic panoramic views from various lookout points. It also houses the Xoriguer Gin Distillery, a traditional distillery left from the British in the 18th century. Cami de Cavalls is a 201km ancient walking path that traces Menorca’s breathtaking coastline and leads to some spectacular beaches. Ancient stone constructions like altars, burial chambers, and watchtowers dating back to 2,000 B.C. can be found all over the island. The most significant sites include Naveta d’es Tudons, Trepuco, Talati de Dalt, and Torre d’en Gaumes. 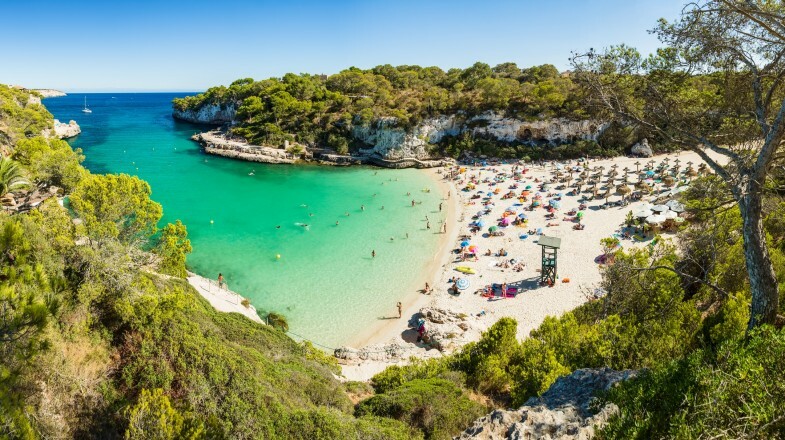 Menorca’s title as a UNESCO World Biosphere means the beaches here are simply idyllic. 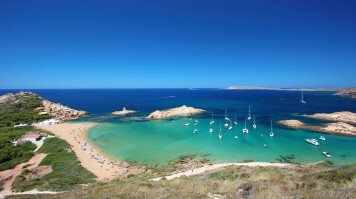 Check out the shores of Cala Turqueta, Cala Macarella, Cala Mitjana, and Cala Tortuga. Unlike Mallorca, there’s limited bus transportation and no train system; renting a car is the only practical way to get around. There’s little nightlife and what Menorca does have is concentrated in the two main cities, Mahon and Ciutadella. 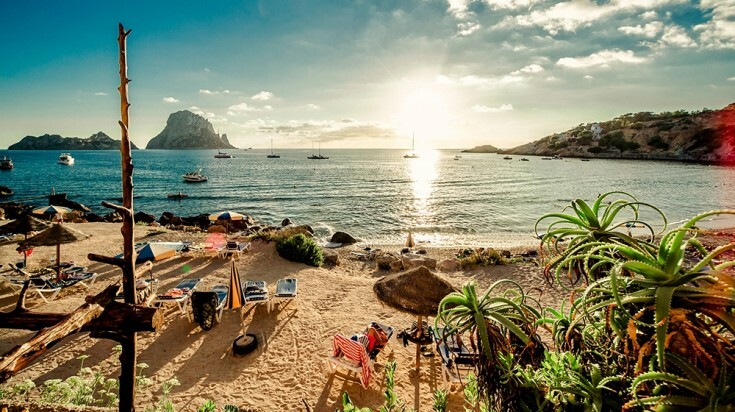 It’s common knowledge that Ibiza is the best Balearic island for those looking for all-night parties, world-class clubs, and an intense international music scene. Tranquil and picturesque by day, Ibiza transforms into one of the world’s most famous nightlife epicenters when the sun goes down. Who is it for: This is a hard-partier’s heaven. Although Ibiza does have a gentler side away from the club scene, it’s still best suited for those who live for late-night fun. Where to stay: Sud Ibiza Suites in the heart of Ibiza Town boasts a beachfront location, solarium, jacuzzi, fitness center, and free use of bicycles for guests. The 45 sq. meter studio apartments offer sea views from the private terrace, a full kitchenette, as well as a sitting and dining area. Prices start at USD 114 per night. The bright, airy, and modern-rustic Hostal La Torre Ibiza Cap Negret is 2km outside the pulsing party center of Antoni de Portmany. With nearby beach and onsite restaurant and spa, this is a peaceful home base for any Ibiza traveler for just USD 77* per night. Playa d’en Bossa is Ibiza’s longest beach and hosts the island’s biggest part scene. Ushuaia and Space, the island’s two biggest and most famous clubs, are also located here. Ibiza Town is the island’s biggest town and hosts the historic Old Town as well as countless bars, restaurants, shops, and a variety of nightclubs. Antoni de Portmany is Ibiza’s second largest town with a generous supply of beach and party. Lounge the shores in the sunlight and head to the city’s famous club like Es Paradis, Café del Mar, or Eden when darkness falls. Spas in Ibiza are almost as famous as the nightlife. Recover from the night before in a holistic spa, indulging in all kinds of luxurious treatments such as a 90 minute anti-aging seagrass treatment on the edge of a cliff-clinging cascading waterfall (Hacienda Na Xamena). Or head to Insotel Fenicia Prestige spa for a blissed-out natural body scrub, seaweed body wrap, and massage combo. Sea Salines Nature Reserve is nearly 3,000 hectares of protected land that boasts rich flora, fauna, and historic culture. Filled with marshes, pristine beaches, and soaring coastal cliffs, UNESCO named the area a World Heritage Nature Reserve for good reason. Millions of tourists visit this island every year. Summer is extremely crowded. The cost for partying in Ibiza has been rising exponentially. Club entrance and tickets are sky-rocketing and one cocktail inside can cost nearly USD 20*. 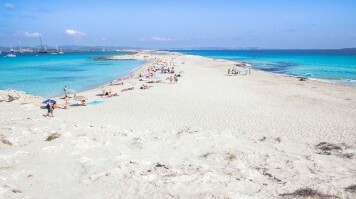 Just thirty minutes away by fast ferry from Ibiza’s southern tip, Formentera provides a welcomed retreat from the madness of Ibiza. At just 20km long, this island entices visitors with lazy days spent on exquisite beaches. If you tire of lounging, rent a bike and explore the islands diverse coastline or shop the local markets for handmade ceramics and quilts. Who is it for: This island is a romantic escape for couples or travelers looking for the more rugged and natural side of the Balearic Islands. Where to stay: Hotel Es Mares is a 4 star hippy-chic hotel in the oldest part of Sant Francesc. The natural stone spa is definitely one of this hotel’s highlights. The beach-inspired room décor is welcoming and unpretentious. The prime location makes it easy to access all the island’s attractive beaches. Rooms start at USD 199 per night. Just a 1 minute drive from La Savina, Hotel Club Sunway Punta Prima is ideally located in close proximity to beaches Illetes and Llevant. Located right on the sea in Es Pujols, guests enjoy an entertainment room, lounge, outdoor swimming pool, oceanfront terrace and volleyball courts. Rooms start at USD 58* per night. Sant Francesc, the island’s capital just 3km from the port, can occupy a day’s worth of time with outdoor market and tiny boutique shopping along the promenade as well as exploring the nearby 18th century churches. Lighthouse hop around the coast and visit the 19th and 20th century island lighthouses in La Mola, La Savina and Cap de Barbaria. La Mola Market is the place to shop for handmade “hippy” goods like purses, bags, jewelry, paintings, ceramics, and clothing by local artisans who settled on the island in the 1960s. It takes place every Wednesday and Sunday in the summer season. Playa Illetes and Llevant are two of the island’s stunning beaches with creamy white sand and translucent turquoise waters. A self-guided bike tour is the best way to discover this unspoiled island thanks to its small size and number of bike trails meandering along the coastline and through the countryside. Rent a bike in the arrival port city of La Savina and take off for the day. The tranquil beach scene can sometimes be ruined by day-trippers from Ibiza. The lack of big resorts and family-friendly facilities make it difficult to entertain children here. The best Balearic Island for you heavily depends on how you prefer to spend your time. The Balearic Islands’ versatility allows it to cater to every kind of holiday. Vacation priorities aside, any visitor will find enough satisfaction just lounging on their world-class beaches, feasting on Mediterranean cuisine, and enjoying the bounty of natural beauty of the Balearic Islands.